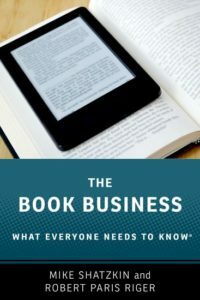 This is the third year in a row that we’ve put together the Making Information Pay conference for the Book Industry Study Group, in conjunction with Ted Hill of THA Consulting. We’ve repeated the formula we’ve applied for the past two years, doing an industry survey on the conference theme to provide some additional insight. This year’s conference is called “Points of No Return.” It looks at things from the perspective of publishing’s employees and seeks to discover when the markets, technologies, and process changes make things so different that old skills don’t map, old organizational structures have to be completely revamped, and people really have to develop new capabilities, accept new roles, or be forced to move on. 1. The preponderant majority of workers in all parts of publishing — editorial, marketing, sales, IT, distribution — believe that significant changes caused by technology either have occurred or are occurring now. No surprise there, but the surprise will be that there is one function people think is changing much less than everything else. And wouldn’t you know it is one that I think will likely change more than any other over the next few years? 3. What I found to be a startling percentage of our respondents think Twitter is a fad, soon to fade away. Making Information Pay delivers a concise program: two 90-minute sessions surrounding a 30-minute networking break that starts at 9 and concludes at 12:30. We designed the program so that the first 90 minutes delivers facts and insights about the industry and the second half features reports from the front lines of change. After BISG Executive Director Scott Lubeck opens the program and I deliver a very short keynote, Kelly Gallagher of Bowker will begin the morning segment talking about what Bowker PubTrack Consumer has discovered consumers are saying that is relevant to publishers thinking about points of no return. PubTrack has delivered some great insights over the past year, from demonstrating how important in-store display is to book sales to quantifying consumer attitudes about ebooks in a special study done jointly with BISG. He will highlight the Bowker findings most relevant to our program’s theme. The Gilbane Group is also working with BISG, doing research on the seven “essential processes” (which I still call “systems”) that publishers need to keep up to date in order to stay viable as their businesses change. Do your production processes support tagging chunks of content that you might want to sell separately from the whole book? If not, you will lose revenue as the market for fragments develops. Does your royalty accounting process enable you to report to authors on sales of this kind and divide revenues appropriately? If not, then you’ll have a different set of problems exploiting those new opportunities. David Guenette of Gilbane will tell the MIP audience what the seven essential processes are, why they’re critical, and what pitfalls await if they are not ready for what’s coming. George Lossius of Publishing Technology will tackle one of the paralyzing challenges of our current environment: how can publishers make substantial investments in technology when the business climate is changing so quickly around them? Lossius maintains that there are things we do know that can guide us; he’ll be helping publishers see what truths are stable and reliable to guide their investment decisions, even when a lot is not. Jabin White of Wolters Kluwer has worked through some major process changes within his own company. We’ve asked him to focus on the people-centered challenges of those changes. How do you bring people along when change might be making them uncomfortable or unhappy? And how does an organization deal with the changes in job skills required, which could mean changes in the particular people required, in the least disruptive way? The second half of the program will start with Bruce Shaw and Adam Salamone of Harvard Common Press who will present an eye-opening view of how the strategy for new title acquisition changes when a publisher becomes sensitive to its role as a vertical player. They demonstrate convincingly that decisions change when an editor sees they are acquiring content for a database rather than simply publishing a book. Matt Baldacci of Macmillan, who oversees all the marketing spending at his company, is covering the challenge of changes in where marketing dollars are allocated, and the processes and skill sets necessary to do successful marketing in today’s marketplace. Maureen McMahon of Kaplan draws on her prior experience directing sales at Random House to analyze the changes in sales, which she sees as having moved from requring “closing” to requiring “connecting”, all of which leads to different hiring criteria than she would have applied only a few years ago. And on top of that, BISG has two sponsors with useful messages. Steve Walker of SBS Worldwide offers his Electronic Distribution Center, which gives publishers completely new supply chain capabilities and a web-based tracking mechanism that cuts administration and communication costs at the same time. And John Konczal of Sterling Commerce has tools to enable new business models, such as those that the Gilbane analysis points out as requirements earlier in the conference. We’re very excited about this program; we think people at every publishing house will have something to take home and apply that very afternoon, which is always our objective. As readers of this blog well know, I’ve been speaking at, running, and going to digital change conferences for almost two full decades. To my knowledge, there has never been one before that focused on people in their jobs. How will mine change? Will I still be able to do it? Will it still be here for me? And what do I have to do to make sure I can stay employed in publishing? We think these are questions a lot of people are thinking about. If you’re one of them, join us at Making Information Pay on May 6! I am interrupting the “What I Would Have Said in London” series to bring you this time-sensitive post. We’ll resume WIWHSIL with Part 2 tomorrow.